SAUGERTIES, NY (December 7, 2015): HITS, Inc., home of the Triple Crown of Show Jumping, is pleased to announce the return of the Federation Équestre Internationale (FEI) Furusiyya Nations Cup™ CSIO-4* to the Ocala Winter Festival, February 16-21, 2016, the fifth week of the HITS Ocala Winter Circuit. Boasting a $100,000 prize purse, the namesake Nations Cup, presented by Edge Brewing Barcelona, will offer the only stateside chance to qualify for the Furusiyya FEI Nations Cup™ Jumping Finals in Barcelona, Spain, later that year. The Furusiyya FEI Nations Cup™ will take place Friday, February 19 at 1pm EST. The HITS Organizing Committee and the United States Equestrian Federation (USEF) will invite thirteen nations to participate in Nations Cup competition. The riders representing the United States will be chosen according to the approved Selection Procedures using the Rolex/USEF Rider Ranking List and by U.S. Chef d’ Equipe Robert Ridland. Acclaimed course designer Alan Wade, of Tipperary, Ireland, has been selected by HITS to develop and design the field-of-play that will be used on February 19. Throughout the HITS Ocala Nations Cup Week, over $270,000 in prize money will be given away in the FEI Jumper division, in addition to over $90,000 total prize money in nationally ranked classes. Spanning four days of competition, Nations Cup Week at HITS Post Time Farm in Ocala will host several notable classes in the FEI Jumper Division. 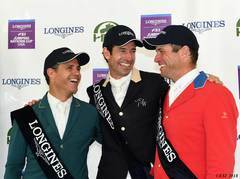 Highlights include the $5,000 Welcome Stake and the $34,000 Thursday Prix on Thursday, February 18; the $100,000 Furusiyya FEI Nations Cup™ on Friday, February 19; the $34,000 HITS Jumper Classic on Saturday, February 20; and the $100,000 Ocala Grand Prix on Sunday, February 21. A complete schedule is available at HitsShows.com. Throughout the FEI Nations Cup™ Week at HITS Post Time Farm, HITS will offer an upgraded hospitality experience in the Overlook VIP Club featuring ringside seating and complimentary beer and wine, as well as the culinary art of Executive Chef Giuseppe Napoli of The Tavern at Diamond Mills in Saugerties, New York. VIP tables are expected to sell out and reservations are encouraged. For Overlook VIP Club information and bookings, contact Chris Mayone at Chris@HitsShows.com. 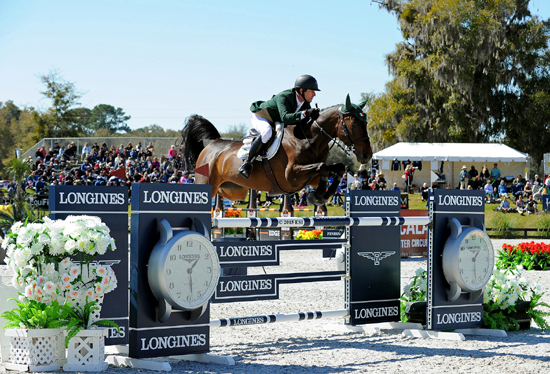 Team Ireland's Kevin Babington and Shorapur at the 2015 Furusiyya FEI Nations Cup at HITS Ocala CSIO4*.